Hi everybody! This is Todd, Anna’s husband, filling in for a quick guest post. Unfortunately, Anna isn’t feeling so great and hasn’t been able to bake anything for the last couple of days. Hopefully, she’ll be back to her old self soon. I sure hope so, I can’t cook and I’m going to starve without her. I would love to provide you with a recipe today, but you’ll be better off if I don’t. Trust me on that. Instead, our dog’s namesake’s grandson got married today over in England, so I figured I would share a couple of pictures of Lizzie the Corgi. 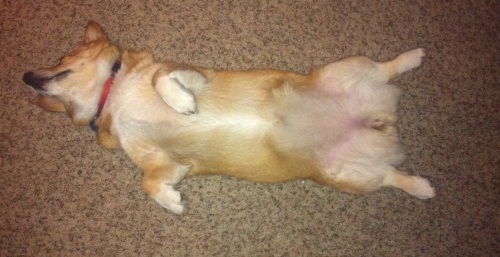 As you can see, she likes to sleep on her back. Lizzie doesn’t let me take a lot of pictures of her. She usually sees me pointing my phone at her and runs around, which makes my Lizzie the Corgi photos fall into two categories: blurs and sleeping. While I’m here, I wanted to show you this picture of a really neat looking cloud I took while we were out on a walk the other day. It turns out a lot of people saw it and did the same thing. There’s even a web site dedicated to pictures of this one cloud! When I took this, the sun was behind us, so the cloud looked like it was glowing. I have a picture from about five minutes before this one and the top of the cloud is pure white and the bottom is glowing bright orange. Anyway, like I said, hopefully Anna will be back to normal soon. Otherwise, you’ll be getting pictures of corgis and poorly written recipes, mainly involving heating things up exactly as the packaging indicates. Hope Anna gets well soon. Oh, gosh, I am now really worrying about her. Please send along my get well wishes. I love the Corgi pictures!! But do feel better soon because I love recipes too!! So sorry to hear Anna isn’t feeling well. Hope you get well soon Anna! 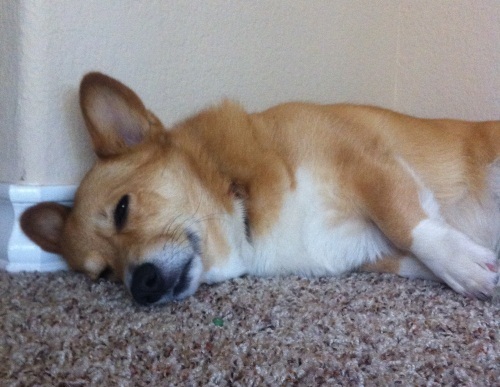 In We love the corgi pictures so keep em coming! Nice post Todd! Hi Todd- so nice of you to do that! I’ve been reading your blog for years and years but have always been too shy to comment since I don’t have my own blog. But I’m really sorry to hear you’re not feeling well, and I just wanted to wish you well and thank you for your wonderful recipes (I’ve tried many, and they’ve all been great!) and your writing, which never fails to cheer me up. Todd, delightful and very sweet post. Love the cloud photo. Hope she’s feeling better soon. Sending a healing prayer her way! Hope you’re feeling better soon, Anna! I hope you are feeling better very soon, Anna! Nice belly shot of Lizzy! Hope Anna is back to baking soon! Thanks for the guest post Todd :-). Wishing Anna a speedy recovery. Todd, you have a real knack! Thanks for filling in for Anna. Anna, I hope you feel better soon. Take good care of yourself. Great post Todd! Tell Anna that I hope that she gets to feeling better. We miss you guys. Thanks for the update! Feel better soon Anna! Anna, hope you are on the mend and Todd, thank you for the pictures and helping Anna. Anna, you are always posting recipes and helpful hints for us. This is for you: 7 Up or sprite and crackers or dry toast for bad stomach. Hot toddy (no pun intended!) or tomato tea and neti pot for bad cold. Hot toddy: Pour a shot of Whisky into a cup and add boiling water to it. Add a spoonful of honey or sugar. Add a half slice of lemon, two cloves and, if available, a cinnamon stick. Let brew for three to five minutes. Depending on preference, the cloves and cinnamon stick can be removed before drinking, although leaving them in is often said to make a toddy even better for clearing a blocked nose and relieving a head cold. Todd you did an awesome post…sounds like you are taking good care of Anna just like she takes care of you. Wishing her a very speedy feeling better! Sending hugs, Anna! Feel better soon. I hope Anna is starting to feel better. Thank you for the update and the pictures. The cloud shot is stunning! I wish I could come by with something for all of you but it’s long way from here to there. Lots of fluids and lots of rest will hopefully have her on the mend soon. Get well soon Anna! So nice to see a peaceful cloud, instead of those terrible funnel clouds. Boo, tornado season! I do hope Anna will be feeling better soon. If she’s too sick to bake, I figure she must be pretty sick! please give anna my best. rest, water and i know i told her already but need to tell her again (for it saved me when i was really sick). she needs to eat fruits high in vit C. like canteloupe. those foods really help ‘clean out’ the infections. Get well soon Anna! You got a sweet hubby there for keeping up the post for you. I liked your post Todd, you should write here more often (and start developing some of your own favorite recipes). Hope Anna feels better soon, and that you are at least getting her the occasional cup of soup! Take care Anna – get well soon – we miss you! What a loving husband…he even blogs for you! Feel better Anna! We miss you, and thank you Todd for the update and Lizzie photos. Lizzie looks so calm, despite the exciting developments in her extended British family! Thanks for the cloud photo and update on Anna. I hope Anna is well soon and things get back to normal in the Ginsberg household. Hope Anna gets well soon!! Feel better, Anna. Regards to Emma, Lizzie and, of course, you, Todd. What a sweet post! I hope Anna gets well soon. Thanks for the update. Sorry it’s hanging on so long, Anna. Hi Todd. Feel better soon, Anna! 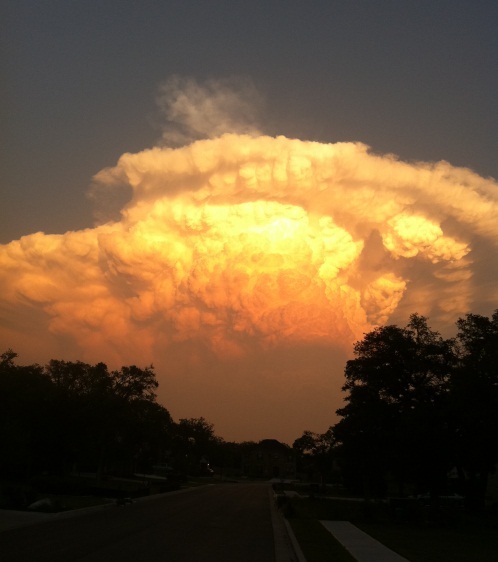 Hey Todd awesome cloud shot, did you stay long enough to see the UFO break through :)? (I thought it was funny). Let Anna know that we all hope she gets better soon. In my opinion the best cure for any cold or illness is a roll of McVitie’s (or your favourite brand) Milk Chocolate Digestive Cookies; or plain Digestives if you’ve had too much chocolate. They’re equally awesome :). It’s considered health food, right? So you can eat the entire thing and still feel good about yourself :). I hope she’s feeling better soon! My Reader stream is a bit less delicious without her. Hi Todd, please make a lovely warm lemon honey drink for Anna and soothe her soul. 🙂 Get well soon!